We are ramping up for Triangle Vegetarian Society's big annual Thanksgiving (the country's largest vegetarian Thanksgiving - check out last year's details) and our fabulous webmaster, who puts together a very nice online reservation system, came over tonight to do some work on our member database. I love the carrot-ginger soup that my VitaMix so easily makes (we just substitute raw cashews for the tofu), and wanted to make some for him, I served this with dinner (my toddler especially liked it!). 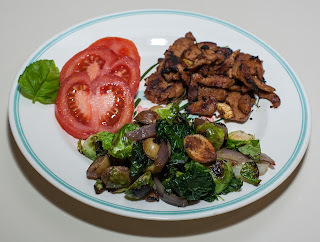 I also made a simple stirfry with seitan, onion (two kinds and put in at different times during the cooking - about a quarter yellow onion early on, and maybe a tenth more near the end, along with a few thin rings of red onion), baby bok choy, spinach, and baby kale. Fresh lemon sage from my garden and a little bit of coconut aminos completed the dish. Finally, I served baked purple potatoes. Our colleague ordered the Bud-m-Joon and invited us to take home its leftovers. 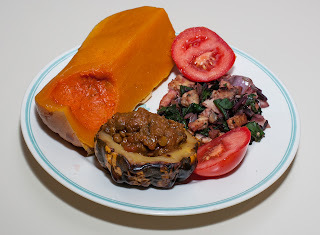 I served it today stuffed inside a baked carnival squash half. I also baked butternut squash and served it with just a bit of Earth Balance margarine. We received in our online farmer's market delivery today some beets with greens; the greens are actually more nutritious than the roots. These greens weren't in the best shape, so were better to be cooked than eaten raw. I made a simple saute of most of the greens from the bunch, chopped into about 1" lengths, along with tempeh and a little bit of red onion. 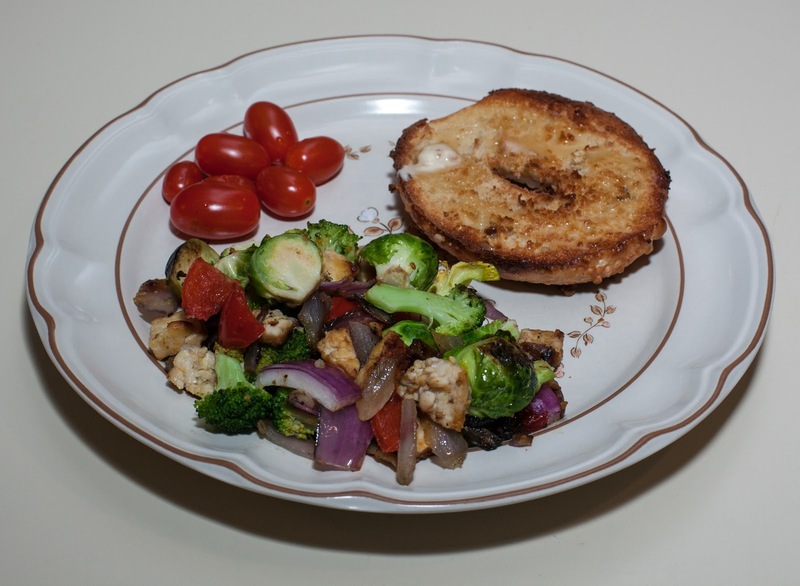 A few tomato slices added a little bit of raw color and completed the meal. The Bud-m-Joon went great with the squash - in fact, I think this is now my favorite way of eating this tasty dish from Sage! When we were at Earth Fare on Thursday, we found American Flatbread's vegan pizza on sale. 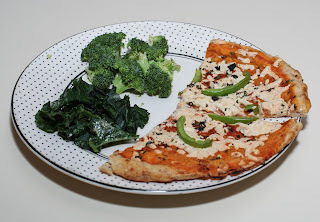 My daughter and I love this frozen pizza - it has a great thin and crispy crust, a tasty sauce, and just the right amount of Daiya vegan cheese. My wife went to a concert tonight, so I made a simple pizza dinner for my daughter and me, supplemented with marinated kale and fresh broccoli. Yesterday, I picked up some tasty small creamer potatoes and some kale. I was thinking of making a stirfry with tempeh, but we didn't have tempeh in stock. I decided to make a saute without it and make a side dish of seitan. For the saute, I used the potatoes, as well as Brussels sprouts and kale. 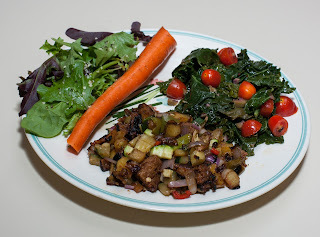 I made one of my favorite side dishes, limed jerked seitan. 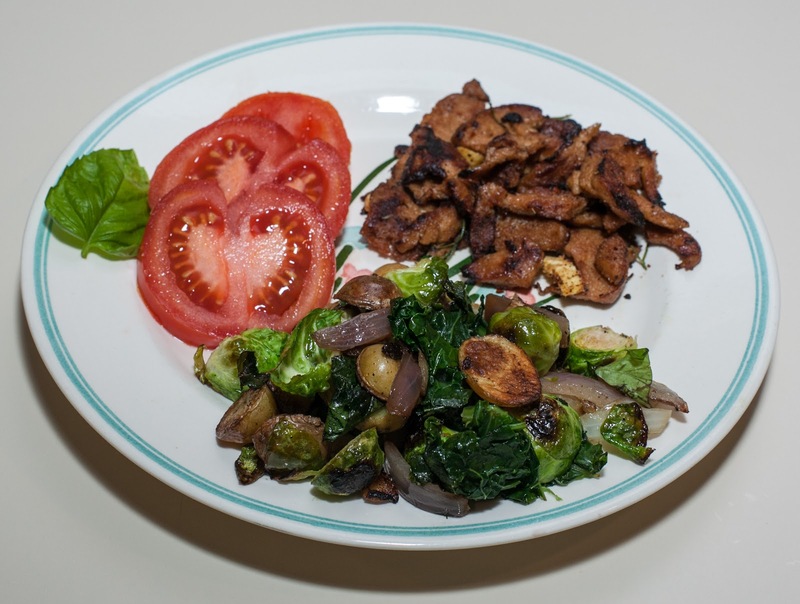 My wife, toddler, and I always love seitan prepared this way (my toddler generally avoids hot spices, but a little bit of jerk seasoning in seitan seems to go over just fine for her). The main course turned out to be quite tasty, too! Today, I enjoyed our weekly stay-at-home Dads' gathering at our local airport, where there is an observation park. On Thursdays like today when I'm not teaching and in a rush to get back, we often stop at nearby Earth Fare grocery store. They have a nice Thursday deal whereby if an adult purchases from their prepared foods, a child can get a free meal (my daughter gets a spinach tortilla with hummus and vegetables, served with raw vegetables, fruit, and water, and enjoys the whole experience). 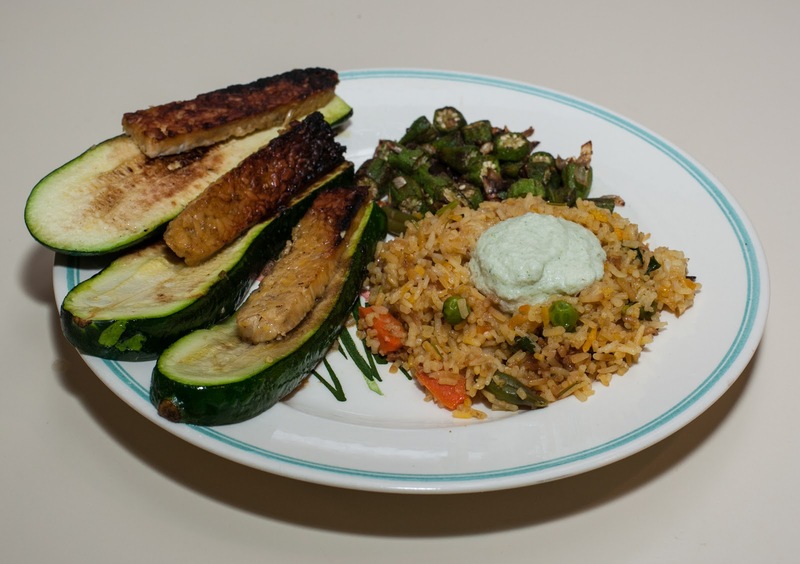 I ate lightly as I knew my wife would be hungry and I'd be cooking for and eating with her. I picked up from Earth Fare a tasty chickpea dish that had dill in it, mindful of being able to put a quality dinner together quickly. Once home, I made a simple whole wheat pasta and added fresh garlic, broccoli, and a little jalapeno pepper to a roasted garlic marinara sauce. 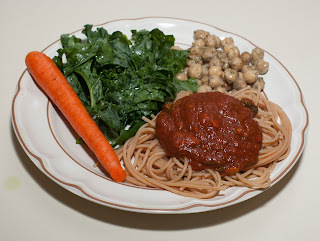 After simmering the sauce, I added it to the pasta, and served along with the chickpeas, raw kale, and carrot. 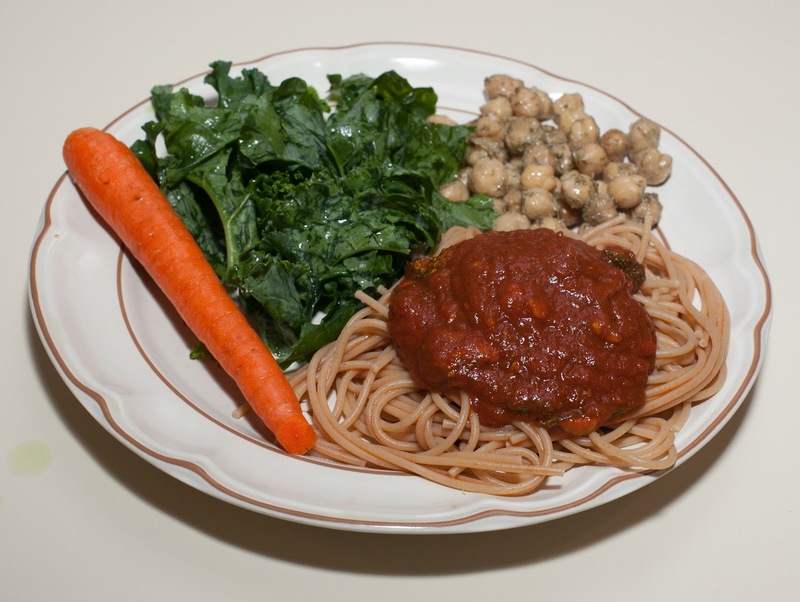 It was good - even my full toddler enjoyed eating some of our pasta and kale. This was my first dinner since we returned late Tuesday night (really early Wednesday morning) from California (yesterday, I ate a bit with my toddler at Whole Foods Market and ate a little bit more later in the evening; my wife ate on her own). San Francisco is my favorite US city and I enjoyed several meals at my favorite restaurant, Millenium. I enjoyed Los Angeles (in spite of its traffic) more than in the past - it has an unbelievable at least 70 vegan and over 100 vegetarian restaurants! We ended our trip enjoying visiting lovely San Diego and a friend whom we hadn't seen in more than five years. The World Vegetarian Congress was a success with great local organizing in San Francisco and Los Angeles, and excellent speakers like Neal Barnard, Brenda Davis, Vesanto Melina, Michael Klaper, Michael Greger, Colleen Patrick-Godreau, John Robbins, and many more. I had never seen or met John McDougall before; he spoke at both conferences, strongly advocating starch. Dietitian Jeff Novick gave the opening address in Los Angeles on nuts, showing his view that they are overrated and in fact are moderate or poor in terms of a healthy nutritional profile (he did say that if one is already on a healthy plant-based diet, one could admit an ounce or perhaps two of nuts a day with no significant issue). The San Francisco folks already have videos from their conference available. You can see my introduction (at about the seven minute mark), with toddler in my arms (she got a round of applause for being a vegan since conception). I led a panel discussion on best international practices in promoting vegetarianism (including a vitamin B-12 toothpaste from Germay, government support in Indonesia and Brazil at the ministerial level, and much more). Michael Greger gave perhaps my favorite talk on nutrition; if you're not already familiar with his excellent video series (he posts detailed nutritional videos every single day!! ), do check out NutritionFacts.org. 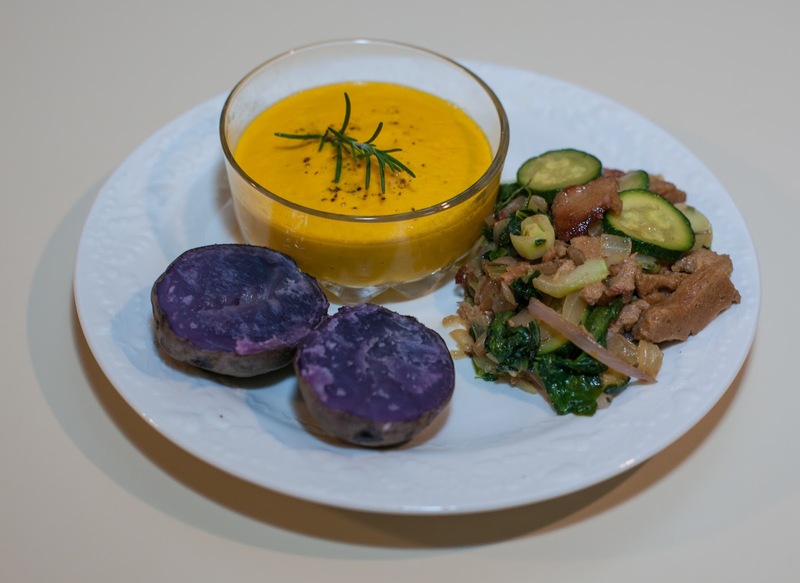 Miyoko Schinner is releasing a book about making vegan cheeses, and demonstrated an amazing fondue and other "cheese" dishes. The International Vegetarian Union (IVU) has a long history, having been founded in 1908. I'm honored to have been on its Council since 2006 and, since 2008, have been its North American Regional Coordinator. Starting with this conference, IVU is now hosting its "Congress" (now just called "Vegfest") every year, not every other year. I've enjoyed the Congress in Canada, Scotland, Germany, and Brazil. Next year, we go to Malaysia; in 2014, we will be in Africa, then in Latin America, India or Southwest Asia in 2016, and in Europe (probably Eastern, perhaps Poland) in 2017. Join us! We're headed tomorrow in the late afternoon for the World Vegetarian Congress in California. It will be in San Francisco this weekend and next Friday-Sunday in Los Angeles. I've been helping to orchestrate this grand event for the past four years and am looking forward to it! I sliced some zucchini and gently sauteed both sides, then added a little bit of herbs and spices (I am actually posting this after our trip, and neglected to note exactly how I spiced, alas, but it could have been a little bit of jerk seasoning). I made a curried okra dish in a manner similar to how my Mom would; I diced the okra into 1/2" cubes and sauteed, mixing in (probably) some turmeric and powdered cumin near the end (I also included onion in the saute, which my Mom would not have done). We had some leftover Biryani rice from Sitar Indian Restaurant. I served that with some coconut chutney. We enjoyed the meal!